THIS cleft in human nature of which I have been speaking also finds expression in everyday communal life. You find it in the relationship of two human capacities which even the most casual examination shows as belonging by their very nature to the life of both soul and body. You have on the one hand the faculty of memory, an important factor in soul-life, but bound up with the bodily life; and on the other hand a capacity less noticeable, because men give themselves to it more or less naively and uncritically  I mean the capacity for love. Let me say from the outset that, whether we are speaking about the being of man himself or of his relationship to the world, we must start from the reality and not from any preconceived idea. I have often made use of a somewhat trite illustration of what it means to proceed from ideas instead of from reality. Someone sees a razor and says, That is a knife, a knife is used for cutting up food! So he takes the razor for cutting up food, because it is a knife. Scientific conceptions about birth and death as they relate to man and animal are somewhat like this, though people are not generally aware of it, believing the subject to be a very learned one. Sometimes these ideas are even made to cover the plants. The scientists form an idea of what birth is, or what death is, just as one forms an idea of what a knife is, and then go on from that idea, which of course expresses a certain series of facts, to examine human death, animal death and even plant death, all in the same way, without taking into account that what is usually comprised in the idea of death might be something quite different in man from what it is in animals. We must take our start from the reality of the animal and the reality of man, not from some idea we have formed of the phenomenon of death. We form our ideas about memory in somewhat the same way. It is particularly so when the concept of memory is applied indifferently to both man and animal, with the object of finding similarities between them. Our attention has been drawn, for example, to something that happened in the case of the famous Professor Otto Liebmann. An elephant, on his way to the pond to drink, is in some way offended by a passer-by, who does something to him. The elephant passes on; but when he comes back again, and finds the man still there, he spouts water over him from his trunk  because, so says the theoriser, he has obviously remarked, has stored up in his memory, the injury received. The outer appearance of the thing is of course, seen from such a theoretical standpoint, very misleading, but not more so than the attempt to cut one's meat at table with a razor. The point is that one must always start from reality and not from ideas acquired from one series of phenomena and then transferred arbitrarily to another series. Usually people completely fail to see how widespread to-day is the error in scientific method I have just described. The human faculty of memory must be understood entirely out of human nature itself. To do this one needs an opportunity of watching how the memory develops in the course of the development of the individual. Anyone who can make such a study will be able to note that memory expresses itself quite differently in the very little child from the way it expresses itself from the ages of six, seven or eight onwards. In later years memory assumes much more of a soul-character, whereas in the earliest years of a child's life one can clearly see to what a large extent it is bound up with organic conditions, and how it then extricates itself from those conditions. And if you look at the connection between the child's memories and his formation of concepts you will see that his formation of concepts is very dependent upon what he experiences in his environment through sense-perception, through all the twelve varieties of sense-perception that I have distinguished. It is most fascinating, and at the same time extraordinarily important, to see how the concepts that the child forms depend entirely upon the experiences he undergoes; above all upon the behaviour of those around him. For in the years with which we are here concerned the child is an imitator, an imitator even as regards the concepts he forms. On the other hand, it will easily be seen that the faculty of memory arises more out of the child's inward development, more out of his whole bodily constitution  very little indeed out of the constitution of the senses and therefore of the human head. One can detect an inner connection with the way the child is constituted, whether the formation of his blood, the nourishment of his blood, is more or less normal, or whether it is abnormal. It will be readily remarked that children with a tendency to anæmia have difficulties in remembering; while on the other hand such children form concepts and ideas more easily. I can only hint at these things, for in the last resort everyone, if he has been given the right lines to go upon, must seek his own confirmation of them in life itself. He will then find that it is from the head-organisation  that is, from the nerve-senses organisation  and thus from experiences arising out of perception, that the child forms concepts; but that the faculty of memory, interwoven as it were with the formation of concepts, develops out of the rest of the organism. And if one pursues this study further, particularly if one tries to discover what lies behind the very individual manner of memory-formation, how it differs in children who tend to a short, squat figure and in those who tend to shoot up, one will find a connection clearly indicated between the phenomena of growth as a whole and formation of the power of memory. Now I have said on earlier occasions that the formation of the head represents a metamorphosis of the human being's organic structure, apart from the head organisation, in an earlier earth-life. Thus what we carry about in a particular earth-life as our head is the transformed body (apart from the head) of the previous earth-life, but especially the transformed metabolic-limb system; or what to-day is metabolic-limb man is transformed during the life between death and rebirth into the head-formation of the next earthly life. One must of course not think of it in a materialistic way; it has nothing to do with the matter that fills out the body, but with the relationships of forms and forces. Thus, when we see that the child's faculty of forming concepts, his faculty of thought, depends upon his head-formation, we can also say that his capacity for thought is connected with his earlier life on earth. On the other hand, what develops in us as the faculty of memory depends primarily on how we are able to maintain in a well-organised condition the metabolic-limb system of this present earth-life. The two things go together: one of them a man brings with him from his previous earth-life, and the other, the faculty of memory, he acquires through organising and maintaining a new organism. From this you will understand that ordinary memory, which we have primarily for use between birth and death and which we cultivate in connection with this earth-life, does not suffice to enable us to look back into the life before birth, to look back into our pre-natal life. Hence it is necessary  this is something I constantly emphasise when I am expounding the methodology of the subject  for us to acquire the ability to go behind this memory, to learn to understand clearly that it is something that is of service to us between birth and death, but that we have to develop a higher faculty which traces in a backward direction, entirely in the manner of memory, what has taken shape in us as the power of thought. Anyone who constructs an abstract theory of knowledge substitutes a word for a deed. For example, he says, Mathematical concepts are a priori, because they do not have to be acquired through experience, because their certainty does not have to be confirmed by experience; they lie behind experience, a priori. That is a phrase. And to-day this phrase is to be heard over and over again in the mouths of Kantians. This a priori really means that we have experienced these ideas in our previous earth-life; but they are none the less experiences acquired by humanity in the course of its evolution. The simple fact is that humanity is in such a stage of its evolution that most men, civilised men at any rate, bring mathematical concepts with them, and these have only to be awakened. There is of course an important pedagogic difference between the process of awakening mathematical concepts and that of imparting such thoughts and ideas as have to be acquired through external experience, and in which the faculty of memory plays an essential role. One can also, especially if one has acquired a certain power of insight into the peculiarities of human evolution, distinguish clearly between two types of growing children  those who bring much from their previous earth lives and to whom it is therefore easy to communicate ideas, and others who have less facility in the formation of ideas but are good at noticing the qualities of external things, and therefore easily absorb what they can take in through their own observation. But in this the faculty of memory is at work, for one cannot easily learn about external things in the way in which things have to be taught in school. Of course a child can form a concept, but he cannot learn in such a way as to reproduce what he has learnt unless a clear faculty of memory is there. Here, in short, one can perceive quite exactly the flowing together of two streams in human evolution. Now what is it exactly that lies behind this! Just think  on the one hand you have the human being shaping his concept-forming faculty through his head-organisation. Why does he do that? You have only to look at the human head-organisation with understanding to say why. You see, the head-organisation makes its appearance comparatively early in embryonal life, before the essentials of the rest of the organisation are added. Embryology furnishes definite proof of what Anthroposophy has to say about human evolution. But you need not go so far, you need only look at the adult man. Look at his head-organisation. To begin with, it is so fashioned as to be the most perfect part of the human organisation taken as a whole. Well, perhaps this idea is open to dispute; but there is another idea that cannot be gainsaid, if only one looks at it in the right way; that is the idea that we are related to our head in experience quite differently from the way we are related to the rest of our organism. We are aware of the rest of our organism in quite a different way from the way we are aware of our head. The truth is that our head effaces itself in our own soul-life. We have far more organic consciousness of the whole of the rest of our organism than we have of our head. Our head is really the part of us that is obliterated within our organisation. Moreover this head stands apart from the relationships of the rest of our organism with the world, first of all through the way the brain is organised. I have often called attention to the fact that the brain is so heavy that it would crush everything that lay beneath it were it not swimming in the cerebral fluid, thereby losing the whole of the weight that a body would have that was made of brain fluid and was the same size as the brain; thus the brain loses weight in the ratio of from 1,300 or 1,400 grammes to 20 grammes. But this means that while the human being, in so far as he stands on the earth, has his natural weight, the brain is lifted out of this relationship with gravity in which the human being is involved. But even if you do not stress this inward phenomenon, but confine yourself to what is external, you might well say that in the whole way in which you bear your head, in the way you carry it through the world, it is like a lord or lady sitting in a carriage. The carriage has to move on, but when it does so, the lord or lady sitting in it is carried along without having to make any exertion. Our head is related to the rest of our organism somewhat in this way. Many other things help to bring this about. Our head is, so to speak, lifted out of all our other connections with the world. That is precisely because in our head we have in physical transformation what our soul, together with the rest of our organism, experienced in an earlier earth-life. If you study the four principal members of the human organisation in the head  physical body, ether body, astral body and ego  it is really only the ego that has a certain independence. The other three members have created images of themselves in the physical formation of the head. Of this, too, I once gave a convincing proof: On this occasion I should like to lead up to it by telling a story, rather than in a theoretical way. I once told you that many years ago, when circumstances had brought about the foundation of the Giordano Bruno Society, I was present at a lecture on the brain given by a thoroughgoing materialist. As a materialist, of course, he made a sketch of the structure of the brain, and proved that fundamentally this structure was the expression of the life of the soul. One can quite well do that. Now the president of the society was the headmaster of a grammar-school, not a materialist, but a hide-bound Herbartian. For him there was nothing but the philosophy of Herbart. He said that, as a Herbartian, he could be quite satisfied with the presentation; only he did not take what the lecturer had drawn, from his standpoint of strict materialism, to be the matter of the brain. Thus when the other man had sketched the parts of the brain, the connecting tissues and so on, the Herbartian was quite willing to accept the sketch; it was quite acceptable to the Herbartian, who was no materialist, for, said he, where the other man had written parts of the brain, he needed only to write idea-complexes, and instead of brain fibres he only had to write association fibres. Then he was describing something of a soul-nature  idea-complexes  where the other was describing parts of the brain. And where the other drew brain-fibres, he put association-fibres, those formations that John Stuart Mill had so fantastically imagined as going from idea to idea, entirely without will, automatically, all kinds of formations woven by the soul between the idea-complexes! One can find good examples of that in Herbart also. Thus both men could find a point of contact in the sketch. Why? Simply because the human brain really is in this respect an extraordinarily good imprint of the soul-spiritual. The soul-spiritual makes a very good imprint of itself on the brain. It certainly has had time during the period between death and new birth to call into existence this configuration, which then so wonderfully expresses its soul-life in the observable plastic formations of the brain. Let us now pass on to the psychological exposition given by Theodore Ziehen. We find that he also describes the parts of the brain and so on in a materialistic way, and it all seems very plausible. It is also extremely conscientious. One can in fact do that; if one looks at man's intellectual life, the life of ideas, one can find a very exact reproduction of it in the brain. But  with such a psychology one does not get as far as feeling, still less as far as will. If you look at such a psychology as Ziehen's, you will find that feeling is nothing more than a feeling-stress of the idea, and that will is entirely lacking. The fact is that feeling and will are not related in the same way to what has already been formed, already been given shape. 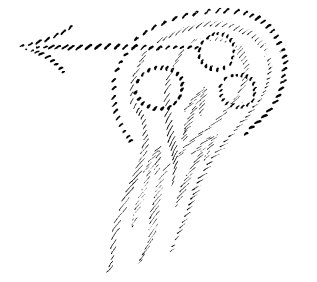 Feeling is connected with the human rhythmic system; it is still in full movement, it has its configuration in movement. And will, which is connected above all with the plastic coming-into-existence and fading-away which take place in metabolism, cannot portray itself in reflected images, as is possible with ideas. In short, in the life of ideas, in the faculty of ideation, we have something of soul-life that can express itself plastically, pictorially, in the head. But there we are in the realm of the astral body; for when we form ideas, the entire activity of ideation belongs to the astral body. Thus the astral body creates its image in the human head. It is only the ego that still remains somewhat mobile. The etheric body has its exact imprint in the head, and the physical body most definitely so of all. On the other hand, in the rhythmic system there is no imprint of the astral body as such, but only of the etheric and physical bodies. And in the metabolic system only the physical body has its mirror-image. To summarise, you can think of the matter in this way. In the head you have physical body, etheric body and astral body, in such a way that they are portrayed in the physical; that in fact their impression can be detected in the physical forms. It is not possible to understand the human head in any other way than by seeing it in these three forms. The ego is still free in relation to the head. If we pass on to the rest of the human organisation, to the breathing-system, for instance, we find the physical and etheric bodies have their imprints within it; but the astral body and the ego have no such imprints; they are to a certain extent free. And in the metabolic-limb system we have the physical body as such, and the ego, astral body and etheric body are free. We have not only to recognise the presence of one of these members, but to distinguish whether it is in the free or the bound condition. 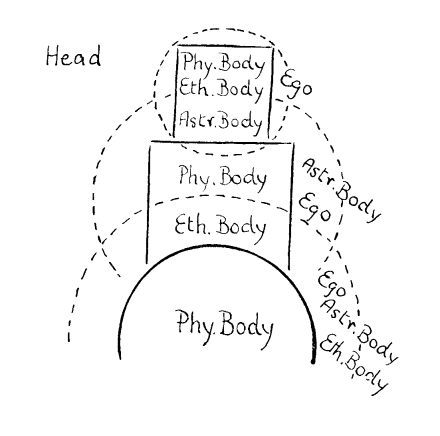 Of course it is not that an astral body and an etheric body have no basis in the head; they permeate the head too. But they are not free within it, they are imprinted in the head-organisation. On the other hand, the astral body, for example, is quite free throughout the rhythmic system, particularly in the breathing. It acts freely. It does not merely permeate the system, but it is actively present within it. Now let us put two things together. The one is that we can affirm a connection between the faculty of memory and the organisation outside the head; the other is that we have to look outside the head also for the feeling and willing organisations. You see we are now coupling together the feeling world of the soul and the world of memory. And if you take note of your own experience in relation to these two things, you will discover that there is a very close connection between them. The way in which we can remember depends essentially on the way we can participate in things, on how far we can enter into them with that part of our organisation which lies outside the head. If we are very much head-men, we shall understand a great deal, but remember little in such a way that we grow together with it. There is a significant connection between the capacity for feeling and the faculty of memory. But at the same time we see that the human organisation apart from the head, in the early stages of its development, becomes more like the head. If you take the embryonal life, then, to begin with, the human being is practically all head; the rest is added. When the child is born  just think how imperfect is the rest of the organisation in comparison with the head! But it is attached to the head. Between birth and death the rest of the organisation becomes more and more like the head-organisation, and shows this notably in the emergence of the second teeth. The first teeth, the so-called milk teeth, are derived more from the head-organisation. It will be easy to demonstrate this anatomically and physiologically when suitable methods are applied. To spiritual scientific investigation it is unquestionable. In the second teeth the entire man plays his part. The teeth which are derived more from the head-organisation are cast out. The rest of the man assists in the formation of the second teeth. In fact, in the first and second teeth we have a kind of image translated into the physical  an image of the formation of concepts and memory respectively. The milk teeth are formed out of the human organism rather in the way concepts are formed, except that concepts of course are translated into the sphere of the mental life, whereas the second teeth are derived out of the human organism more in the way the faculty of memory is derived. One only has to be capable of recognising these very subtle differences in human nature. When you grasp such a thing as this, then you will of course see that one can really understand the structure of matter  particularly when it comes to organic life  only if one understands it in its spiritual formation. The thorough-going materialist looks at the material man, studies the material man. And anyone who starts from the reality and not from his materialistic prejudices, will at once see in the child that this human head is formed out of the super-sensible, through a metamorphosis of his previous earthly life, and then he sees that the rest is added out of the world into which the child is now transplanted; the rest is added, but that too is formed out of the spiritual, out of the super-sensible of this world. It is important to pay attention to such a view. For the point is that we should not speak abstractly of the material world and of the spiritual world, but we should acquire an insight into the way the material world originates in the spiritual world; an insight, so to speak, into the way the spiritual world is imaged in the material world. Only we must not thereby remain in the abstract, but must enter into the concrete. We must be able to acquire an insight into the difference between the head and the rest of the organism. Then in the very forms of the head we shall see a somewhat different derivation from the spiritual world, compared with what we see in the rest of the organism. For the rest of the organism is added to us entirely in the present earth-life, whilst the head organisation, down to its very shape, we bring with us out of our previous earth-life. Whoever reflects upon this will see the folly of such an objection to Anthroposophy as has again recently been made, in a debate which took place in Munich, by Eucken  so highly respected by many people despite his journalistic philistinism. By putting forward the foolish idea that what one can perceive is material, Eucken raised the objection that Anthroposophy is materialistic. Naturally, if one invents such a definition, one can prove what one will; but anyone who does so is certainly ill-acquainted with the accepted method of proof. It is a question of grasping how the material, in its emergence from the spiritual, can be regarded as bearing witness to the spiritual world. Again  and to-day I can only go as far as this  if you grasp the connection between the birth of memory and the forces of growth, you will thereby recognise an interplay between what we call material and what in later life, from seven to eight years of age onwards, develops as the soul-spiritual life. It really is a fact that what shows itself later in more abstract intellectual form as the faculty of memory is active, to begin with, in growth. It is really the same force. The same method of observation must be applied to this as is applied, let us say, when we speak of latent heat and free heat. Heat which is free, which is released from its latent condition, behaves externally in the physical world like the force which, after having been the source of the phenomena of growth in the earliest years of childhood, then manifests itself in the inner life as the force of memory. What lies behind the phenomena of growth in earliest childhood is the same thing as what later makes its appearance in its own proper form as the faculty of memory. I developed this more fully in the course of lectures given here in the Goetheanum last autumn. [* Grenzen der Naturerkenntnis, 27th Sept. to 2nd Oct., 1920 (Translation not yet published.)] You will see how one can discover along these lines an intimate connection between the soul-spiritual and the bodily-physical, and how therefore we have in the faculty of memory something which on the one hand appears to us as of a soul-spiritual nature, and on the other hand, when it appears in other cosmic connections, manifests as the force of growth. We find just the opposite when we consider the human capacity for love, which shows itself on the one hand to be entirely bound up with the bodily nature, and which on the other hand we can grasp, exactly like the faculty of memory, as the most soul-like function. So that in fact  this I will explain more fully in later lectures  in memory and love you have capacities in which you can experience the interplay between the spiritual and the bodily, and which you can also associate with the whole relationship between man and the world. In the case of memory we have already done this, for we have related ideation with previous earth-lives, and the faculty of memory with the present earth-life. In later lectures we shall see that we can experience the same thing as regards the capacity for love. One can show how it is developed in the present earth-life, but passes over through the life between death and rebirth into the next earthly life. Why are we making a point of this? Because to-day man needs to be able to make the transition from the soul-spiritual to the bodily-physical. In the soul-spiritual we experience morality; within the physical-bodily we experience natural necessity. As things are seen to-day, if one is honest in each sphere one has to admit that there is no bridge between them. And I said yesterday that because there is no such bridge, people make a distinction between what they call real knowledge, based upon natural causality, and the content of pure faith, which is said to be concerned with the world of morality  because natural causality on the one hand, and the life of the soul-spirit on the other, exist side by side without any connection. But the whole point is that in order to recover a fully human consciousness, we need to build a bridge between these two. Above all we must remember that the moral world cannot exist without postulating freedom; the natural world cannot exist without necessity. Indeed, there could be no science if there were not this necessity. If one phenomenon were not of necessity caused by another in natural continuity, everything would be arbitrary, and there could be no science. An effect could arise from a cause that one could not predict! We get science when we try to see how one thing proceeds from another, that one thing proceeds from another. But if this natural causality is universal, then moral freedom is impossible; there can be no such thing. Nevertheless the consciousness of this moral freedom within the realm of soul and spirit, as a fact of direct experience, is present in every man. The contradiction between what the human being experiences in the moral constitution of his soul and the causality of nature is not a logical one, but a contradiction in life. This contradiction is always with us as we go through the world; it is part of our life. The fact is that, if we honestly admit what we are faced with, we shall have to say that there must be natural causality, there must be natural necessity, and we as men are ourselves in the midst of it. But our inner soul-spiritual life contradicts it. We are conscious that we can make resolutions, that we can pursue moral ideals which are not given to us by natural necessity. This is a contradiction which is a contradiction of life, and anyone who cannot admit that there are such contradictions simply fails to grasp life in its universality. But in saying this we are saying something very abstract. It is really only our way of expressing what we encounter in life. We go through life feeling ourselves all the time actually at variance with external nature. It seems as if we are powerless, as if we must feel ourselves at variance with ourselves. To-day we can feel the presence of these contradictions in many men in a truly tragic way. That is man's frightful illusion. That is the foundation of pessimism in human nature. The man who has little idea of how deeply such a thing can work into the human soul will not be able to enter into the feeling that this contradiction in life, which is absolutely real, can undermine the whole soul, and can lead to the view that life in its inmost nature is a misfortune. Confronted by the conflict between scientific certainty and the certitude of faith, it is only thoughtlessness and lack of sensitivity that prevent men from coming to such inner tragedy in their lives. For this tragic attitude towards life is really the one that goes with the plight of soul to which mankind can come to-day. But whence comes the impotence which results in such a tragic attitude to life! It comes from the fact that civilised humanity has for centuries allowed itself to become entangled in certain abstractions, in intellectualism. The most this intellectualism can say is that natural necessity deludes us by strange methods with a feeling of freedom, but that there is no freedom. It exists only in our ideas. We are powerless in the face of necessity. Then comes the important question  is that truest? And now you see that the lectures I have been giving for weeks actually all lead up to the question: Are we really powerless? Are we really so impotent in the face of this contradiction? Remember how I said that we have in our lives not only an ascending development, but a declining one; that our intellectual life is not bound up with the forces of growth, but with the forces of death, the forces of decay; that in order to develop intelligence we need to die. You will remember how I showed here several weeks ago the significance of the fact that certain elements with specific affinities and valencies  carbon, oxygen, hydrogen, nitrogen, sulphur  combine to form protein. They do so not by ordinary chemical combination, but on the, contrary by becoming utterly chaotic. You will then see that all these studies are leading up to this  to make it clear to you that what I have told you is not just a theoretical contradiction, but an actual process in human nature. We are not here merely in order, through living, to sense this contradiction, but our inner life is a continual process of destruction of what develops as causality in outer nature. We men really dissolve natural causality within ourselves. What outside is physical process, chemical process, is developed within us in a reverse direction, towards the other side. Of course we shall see this clearly only if we take into consideration the upper and the lower man, if we grasp by means of the upper man what emerges from metabolism by way of contra-mechanisation, contra-physicalisation, contra-chemicalisation. If we try to grasp the contra-materialisation in the human being, then we do not have merely a logical, theoretical contradiction in ourselves, but we have the real process  we have the process of human development, of human becoming, as the thing in us that itself counteracts natural causality, and human life as consisting in a battle against it. And the expression of this struggle, which goes on all the while to dissolve the physical synthesis, the chemical synthesis, to analyse it again  the expression of this analytic life in us is summed up in the awareness: I am free. What I have just put before you in a few words  the study of the human process of becoming as a process of combat against natural causality, as a reversal of natural causality  we shall make the subject of forthcoming lectures.